A is for Akri, and B is for…barbecue! Learn the Alphabet Simi-style! Join everyone’s favorite adorable little demon from Sherrilyn Kenyon’s Dark-Hunters® as she explores the alphabet in her own unique and colorful way in this delightful new children’s book. Simi is one of the most recognized and adored characters from Kenyon’s Nick Chronicles® and Dark-Hunters®. 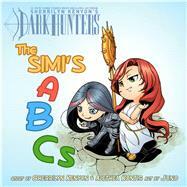 Now you can join her for a thrilling adventure unlike any other as she explores the world of Dark-Hunter® while learning her alphabet. #1 New York Times bestselling author Sherrilyn Kenyon lives a life of extraordinary danger…as does any woman with three sons, a husband, a menagerie of pets and a collection of swords all of the above have a major fixation with. But when not running interference (or dashing off to the emergency room), she’s found chained to her computer where she loves to play with her imaginary friends. With more than sixty million copies of her books in print, in over one hundred countries, she certainly has a lot of friends to play with too. Her books appear regularly at the coveted #1 bestselling spot. This extraordinary bestseller continues to top every genre she writes. Her current series includes: The Dark-Hunters®, The League®, Chronicles of Nick®, Deadman’s Cross™, Nevermore™ and the upcoming Silent Swans™ and Shadows of Fire™. Since 2004, she has placed more than 80 novels on the New York Times list in all formats including manga.